We should take a moment to stand with these students in Seoul, South Korea to honor the tens of thousands of deceased Korean “comfort women” who did not live to see justice. Not that this current agreement between South Korea & Japan, 70 years in the making, is justice. We should note that sexual slavery by the Japanese military occupation included women throughout Korea, now divided into North & South. The deal is being heralded as landmark & historic. Enough with the hyperbole. It’s a shabby agreement based solely on the expediences of military collaboration between South Korea, Japan, & the US & the need to make the issue to go away if military buildup in the region is to go forward without popular resistance. 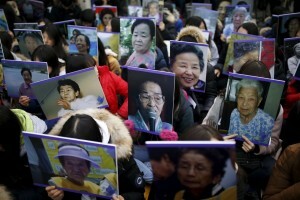 These students hold weekly rallies with portraits of the deceased women in front of the Japanese embassy. There is little available information on the role of Korean & Japanese feminists in educating about & protesting the issue of sexual slavery by Japan. Since prostitution remains an issue in both countries because of the US military presence of nearly 100,000 troops, we can be sure they have been a central part of that campaign from its inception–as the “comfort women” survivors themselves have lead it. Any information on that would be appreciated. Our deepest solidarity with the women survivors who are our sisters & with those men & women who continue to campaign for justice in both countries. You can see in the photos that many of the women survivors were part of that campaign. Our deepest respect & honor. It isn’t just a matter of acknowledging the past but of changing the future for women & our girls.